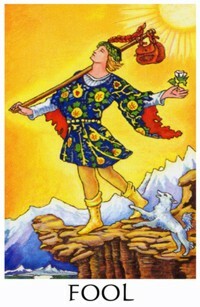 The Fool is a widespread and age old archetype. The Fool is well known through the Tarot, where it represents the beginning and the end of the mental process, which is a circular process. That means that it is difficult to describe the difference between the state of mind that is represented by the unconscious fool (begin) and that of the conscious Fool (end). For the person who experiences the difference, it is beyond any doubt both an end and a new beginning, but for others the person is just the same old fool. The difference between the fool and the Fool is Consciousness, or Love, or God, or whatever it is named. And as we all know, we cannot perceive Love directly, we can only deduce it’s existence from it’s results. The Fool is God/Love/Consciousness realised in a man or woman. Well, we all know one, and how he came to his end when he tried to explain it. 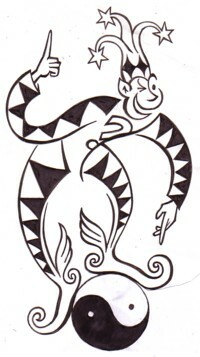 The Fool is also a popular symbol in songs. And it doesn’t matter if the writer of a song knows about archetypes or the esoteric tradition of the fool. That is the power of an archetype: it speaks about itself, even if you think that you are just making it all up. 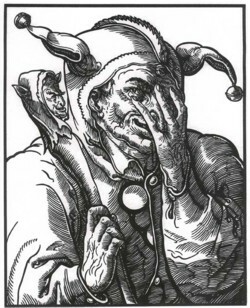 All songs about fools can be interpreted in two complete different ways: either the fool is unconscious (and usually that is what people think of when they listen to a fool’s song), or the Fool is conscious. To hear what the lyrics say from a conscious stand point, you have to take that standpoint yourself, of course. For the Soundtrack of this special day I choose a song that is on a 45 that was a promotional copy. The previous owner either liked the record so much that he played it to death, or he used a nail for a needle in his record player. 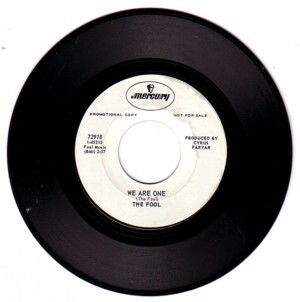 The writer and singer calls himself The Fool, and the title of the song is the credo of the archetypical Fool: We are one. This 45 is made by the Dutch art collective The Fool, featuring Seemon & Maryke. The did album covers and clothing for the Beatles, Move, Hollies, Incredible Stringband, etc.. They also made an lp with the same style of hippie folk psych as this wonderful 45. Hello Peter, thanks for the info! I really never heard this. How did you find this out?